The power of paleoclimate modeling is now at your fingertips, with PaleoClimate™ software. PaleoClimate™ paleoclimate software is a desktop application that employs a parametric approach to model the climate of ancient Earth. 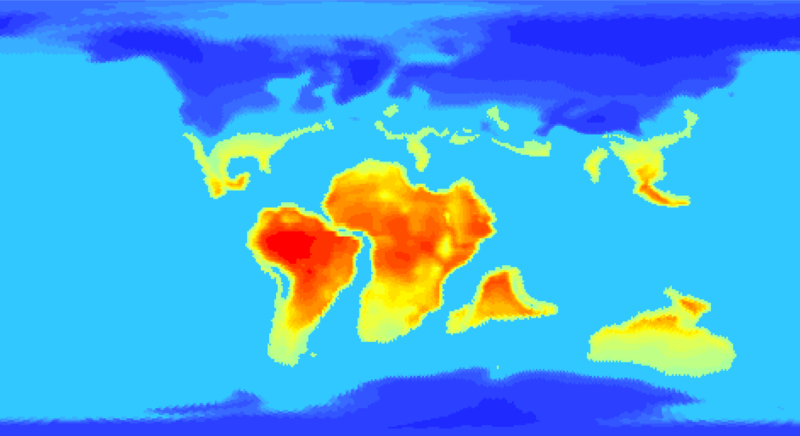 The product uses paleogeographic data as inputs for calculating all paleoclimate outputs. The elevation and distribution of land and sea for a given time is used to predict surface-level pressure, which is then used to compute all other outputs, including sea-level temperature, surface temperature, wind direction and azimuth, ocean currents, coastal upwelling and wetness. As a parameter-driven application, PaleoClimate™ is not intended to replace robust supercomputer-based climate modeling. Rather, our quick-cycle approach will allow geologists and geophysicists to rapidly explore a wide variety of factors and fine-tune assumptions. The results will further strengthen first-pass screening accuracy and/or validate the need to invest in more sophisticated climate analysis. In combination with Digital Elevation Models and other valuable data inputs from commercially and academically available models, geoscientists can dynamically analyze and visualize a wide range of paleoclimate scenarios that may have impacted sedimentary formation. The software application works in conjunction with PaleoGIS, or it can operate as an independent application. Both ArcGIS and open-source versions are available.